The 7D should be more than capable of getting as good a dynamic range as the XH-A1. I wouldn't recommend any special "superflat" styles, however, as they tend to ruin skin tones. Just use neutral with contrast all the way down, sharpening all the way down, and saturation maybe one up (yes, the profile you start from does make a difference). The standard profile on the 7D is absolutely terrible. It's a shock that anyone at Canon approved it. As an aside, I think your problem in these particular shots is dramatically accentuated since the 7D is slightly over exposed and the A1 is slightly underexposed. Tony definitely, I usually try to shoot as flat as possible on the XHA1 in order to color in post. I would never use the XHA1 footage without grading it. Jesse the XHA1 is under exposed however is wasn't possible to get anymore light as I was already at 1/25 shutter, Iris wide open, I do feel 12dB is unacceptable. Here is another comparison. This one I graded with Magic Bullet. I know the conversation is about the tonal range but what strikes me is the color. Is the wall green or brown? I expect it is brown. As others have said, the blown whites are an exposure problem. Yet, your Magic bullet examples look pretty good to me. In fact, I have noticed the tendancy of the 7D to appear to over expose whites (auto Photo mode). Then, just do minor contrast and tonal range adjustments and get an amazing print. Judging from the color in the above images, I would pick up the 7D over the other camera for picture quality. Note that I am not a pro video guy. It would be great for those of you with good understanding of these topics to make a few points about the color differences and the issues in dealing with them. Tony definitely, I usually try to shoot as flat as possible on the XHA1 in order to color in post. I would never use the XHA1 footage without grading it. How did you shoot the 7D footage? Did you turn down the contrast and saturation? I feel like you could have shot a stop lower and brought it up in post but get less noise. Ethan it wasnt a very scientific test, I just happened to have the 7D for the day, which was the first time I handled the camera. The 7D wasn't even my primary camera I simply took a few shots to compare in post and help me decide if the 7D is a useful camera for weddings. simply stopping down with the 7d a bit would have looked better in the original example, not sure using an overexposed image as an example is fair in this comparison. Each of the "presets" such as faithful", "natural" are unique in reference to the slider adjustments? What I mean is if I pick a preset, look at the settings it will all be "zeroed" out and any changes plus/minus will adjust from there? So the scale of adjustments are shifted according to the preset? I am asking because I just always thought that the presets were just pre-configured versions of the sliders. A picture preset is actually a configuration whose parameters cannot be modified in the camera, except with small adjustments via the sliders. You can create your own picture preset with the software the comes with the camera. A) Could any overblown whites be brought down in post?? Or are the pixels lost? If it's blown-out, then it's lost. The camera does better with underexposure. Could a 35mm adapter address the same light issues that the 7D doesn't have? I realize you can't manipulate the ISO setting in the XH A1, but it would be nice to know if an adapter could allow for more light.. Unfortunately, this idea is upside-down. All 35mm adapters eat light. You lose light through the adapter itself, and you lose more light with whatever lens you attach onto the adapter. Just think about it. Anything that you attach in front of the camcorder's built-in lens can only decrease the amount of light that gets passed to the sensor, not increase it. That's one of the main reasons why people are ditching adapters. It's not just the added bulk and operating inconvenience. The 7D files may look more punchy and vibrant strait from the camera, but the 'duller' XH-A1 files hold far more details and could be worked easier in post to replicate the 7D files...but not the other way round. I don't get it. Why would you want to make the images dull? Mikko, dull images allow for better grading options in post. 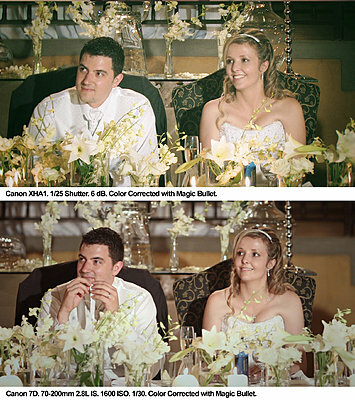 Images when filmed is naturally dull, the camera then enhances the image so that it looks better, the camera is doing most of the grading for you already however should you decide to change the look of the image later it's harder to achieve the look you want because you are applying a grade over a grade and thus losing quality. It's for this reason that shooting RAW is so popular. I find that using the Neutral custom setting on the 7D with saturation turned down and always biasing slightly to underexposure helps out. Even when using a monitor it's difficult to keep exposure correct. In situations where there aren't second chances and the situation is dynamic, consider using Manual shutter and aperture settings in the best lit scenes with ISO 160 and then put ISO into Auto. I think you will find fewer "blowouts" this way and the camera smooths out the exposure better than you can with the discrete aperture stops on a DSLR. You can always press exposure lock to override a pan where I don't want the exposure to adjust. Last edited by Roger Shealy; February 28th, 2010 at 11:43 AM. Tend to agree Roger. Good tip about exposure lock too. I'd prefer to let the cam do it since I cant trust what Im seeing myself. There are those who believe that the codec isn't strong enough to allow for a lot of grading before noticeable artifacts appear, so in their opinion, trying to get to the final "look" as closely as possible in-camera is a wiser option. Another option is to enable Highlight Tone Priority. I'm surprised that nobody else has mentioned it here already. However, HTP has been shown to slightly increase image noise.